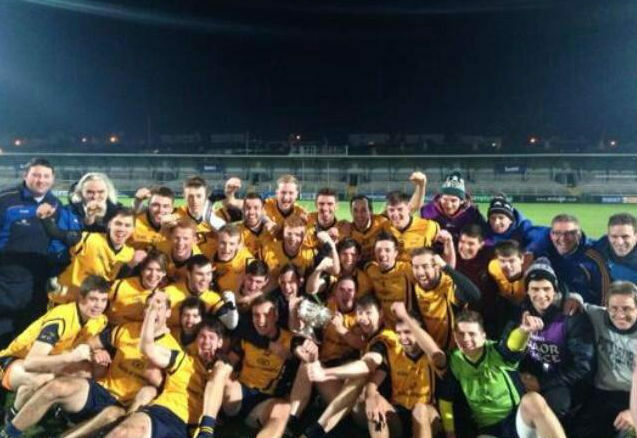 Conor McGraynor netted twice to inspire DCU to victory in the Ryan Cup final over St Mary’s last Wednesday. On a cold night in Co. Armagh, McGraynor lit up the the Athletic Grounds with an excellent display, registering 2-2 from open play. DCU came into the final high on confidence, after a convincing six point win over UCC in November. Niall Moyna’s side looked sharp from the start, with a goal in the opening five minutes exposing the predatorial instincts of the Wicklow man. A floated ball into the edge of the square wasn’t dealt with properly and McGraynor used every inch of his frame to tip the ball into the net. Barry O’Hagan levelled up the match on 26 minutes after some excellent St Mary’s interplay and the Belfast side trailed by a point at the break. St Mary’s – looking for their first title since 1985 – then took the lead just two minutes after the restart. A mistimed jump in the DCU full-back line gave full-forward Jerome Johnston a one-on-one opportunity, which he duly dispatched. His brother, Ryan, also got himself on the scoresheet, but, with only one point, was ineffective for the duration. After a flurry of points in the opening 10 minutes of the second half, the Glasnevin side found the back of the net once again. An excellent effort rebounded off the bar and it was McGraynor on hand again to apply the finishing touches from close range, to give DCU an advantage they refused to relinquish. DCU’s firing line looked industrious all evening, with Moyna’s side registering five individual scorers including Colm Begley and Conor Daly. Conor McHugh was a picture of composure, scoring four points from frees, closing out the game with a 100 per cent kicking record. McHugh, who was a constant figure for DCU during their cup campaign, personified his team’s performance showing authority on the ball and precision from dead ball situations. With the Dublin side in the ascendancy, the tackles flew in and tempers began to boil over in the closing stages. St Mary’s misery was compounded in the dying minutes as the Belfast side finished the game with 14 men when midfielder Peter Carragher was shown a red card. It wasn’t just players contesting the high ball, however, with what appeared to be a UFO busying itself around the night sky. It became clear after the match that the object was a drone, attached with a camera, filming the final. The drone was remotely operated by an IT technician from the Belfast university and the experimental style of streaming live fixtures is sure to catch the attention of sports coverage providers in the coming years. DCU: B Flynn; J Smith, D Wrynn, C Begley; J Bealin (D Ward, 35’), D Byrne, C Daly; T Flynn, S O’Brien (C Meredith 35’); E O’Connor, D Smith, E Smith; C McHugh (C McNally 52’), C McGraynor (S McCoy 59’), R Connor.